Every last detail in our Travelodge SuperRoom™ has been carefully chosen to improve your stay, from your in-room Lavazza A Modo Mio coffee machine to the Hansgrohe Raindance 3jet adjustable shower. With blackout curtains, 32" Samsung Freeview TV and in-room hairdryer, iron & ironing board and a choice of firm or soft hypoallergenic pillows. Travelodge SuperRooms™ are the perfect choice with added comforts. Right place. Right Price. That's Travelodgical. Savour the smell of freshly brewed coffee with our in-room Lavazza A Modo Mio capsule coffee machine, the perfect way for coffee lovers to start the day. Choose from a Lungo Dolce coffee - a sweet Asian and Central and South American Arabica blend or a Qualità Rossa Dek decaffeinated Brazilian Arabica and South East Asian Robusta full-bodied espresso. Enjoy that authentic coffee shop flavour from the comfort of your room. Get refreshed with our Hansgröhe Raindance 3jet adjustable shower - a rejuvenating start to your day. Choose between 3 different water flow settings, RainAir (rain jet enriched with air to makes the droplets plumper and lighter), Rain (perfect for rinsing shampoo from hair quickly) and the WhirlAir (massage spray). 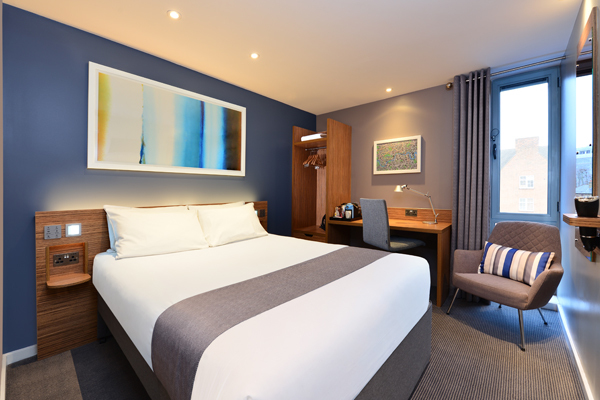 Our new SuperRooms™ feature a choice of firm or soft hypoallergenic pillows, allowing you the extra comfort you need to drift off into a relaxing sleep. Every SuperRoom™ has a 32" Samsung Freeview LED TV, the perfect size for you to watch from the comfort of your king size Travelodge Dreamer™ bed. Feel like a king or queen in our new comfy chair, the perfect place to work or relax. Our sleek SuperRoom™ bathroom is designed with a new curved shower curtain pole to give you more space to sing and dance to your heart's content under the Hansgröhe Raindance 3jet adjustable shower. There are USB charging points provided throughout so you can recharge your devices and relax.